No doubt, State Rep. Brian Dempsey, chairman of the House Ways and Means Committee, has never talked with Joan Douty, the mother of a resident of the Glavin Regional Center in Shrewsbury. Joan could tell Rep. Dempsey how the staff at the center saved her daughter’s life by getting her to stop repeatedly banging her head as she previously did in a community-based group home. Anna Douty banged her head so violently and continuously — a behavior that the group home staff did nothing to stop — that she eventually detached the retinas in both of her eyes and is now blind. Glavin provides high-level Intermediate-level Care, based on federal standards that do not apply to the community-based, group-home system in Massachusetts. Joan could also tell the Ways and Means chairman that she herself will probably no longer be able to visit her daughter if she is transferred to another Intermediate Care facility (ICF) once Glavin in closed. Joan Douty, who is in the end stage of renal disease, undergoes dialysis treatments three days a week, and cannot drive for long periods in a car. Glavin is close to where Joan and her husband Brad live. It would be prohibitively long for her to drive to either the Wrentham Developmental Center or the Hogan Regional Center in Danvers, the only ICFs that will remain in the state after the Patrick administration completes its planned shutdowns of the Glavin, Fernald, Monson, and Templeton Centers. 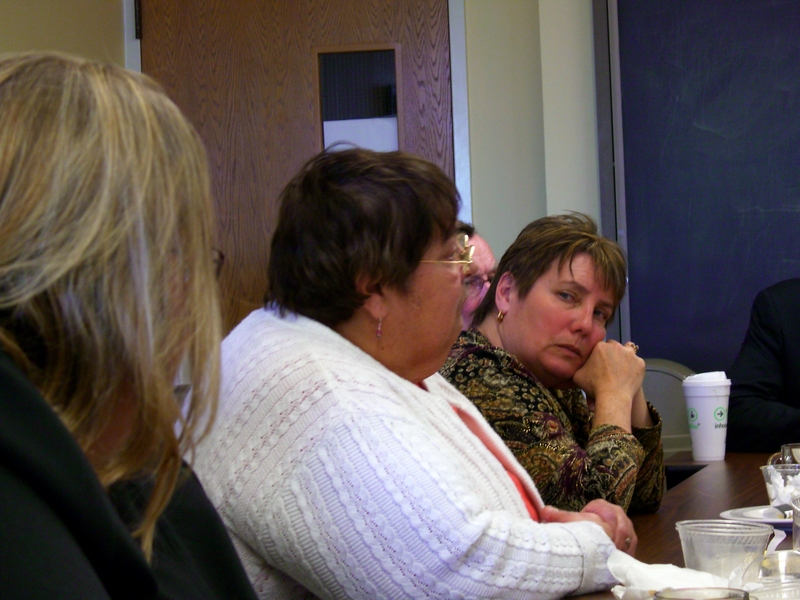 The House budget amendment had been filed by Rep. Anne Gobi, D-Spencer, who did listen to Joan Douty’s story last month at a legislative breakfast at the Glavin Center (see photo). The administration, which also has no time to listen to people like Joan Douty, claims Glavin and the other centers must be closed because they’re too expensive to operate. But COFAR has maintained that the administration’s claimed cost savings in closing the centers appears to be based on an apples-to-oranges comparison of the average community-based resident and the average facility-based resident. Developmental center residents are older, more medically involved and more intellectually disabled on average than community-based residents. Moreover, as COFAR and other advocates have noted, the centralized services model of the developmental centers is highly cost-efficient when compared to the dispersed clinical, medical, and day services that characterize the community system. COFAR has called since last year for an independent study of the cost of closing or maintaining the developmental centers because previous budget amendments have resulted in flawed analyses done by the administration itself, concluding, of course, that the facilities should be closed. But here’s the problem. In the Massachusetts Legislature, a handful of people make all the decisions, and Rep. Dempsey is one of them. There was no floor vote this week on Rep. Gobi’s amendment for the independent study. In a closed-door meeting in his office, Dempsey simply ordered that Gobi’s amendment be scuttled. It was not included in a catch-all budget amendment boosting human services line items that will be voted on this week. Among those who Rep. Dempsey apparently has been listening to are the human service vendors in Massachusetts, who run most of the community-based group homes in the state and who are seeking more business when the developmental centers are closed. In a letter sent to Dempsey and other legislators a day before Gobi’s amendment was thrown out, the Association of Developmental Disabilities Providers continued to pump out misinformation about the developmental centers. Among the other pieces of misinformation in the ADDP letter was the claim that the developmental centers aren’t needed because “families overwhelmingly choose community settings for their loved ones.” The ADDP letter didn’t mention that that’s because admissions to the developmental centers have been effectively blocked since the 1980s. The fact is that families that are being transferred from the developmental centers targeted for closure have overwhelmingly chosen to be placed at other developmental centers or in state-operated group homes. They are avoiding the vendor-run system because they know it is beset with problems of poorly paid and under-trained staff. The Senate now remains the only real hope for this sorely needed independent cost study. We believe the study should be done by a non-governmental entity selected by either the State Inspector General or State Auditor. Once again, though, the question remains whether Senate leaders will allow such an amendment to be debated in the light of day or whether they will do what the House did and quietly kill it in the proverbial smoke-filled room. How accurately is the state tracking salaries earned by human services contractors in Massachusetts? We looked at state fiscal reports, known as Uniform Financial Reports (UFR’s), which were filed by three of the largest contractors to the Department of Developmental Services, and we think these records raise that question. In each case — the May Institute, Vinfen, and Seven Hills — the UFRs for the Fiscal Year 2009 listed lower salaries and other compensation for the same executives than did 2009 IRS tax filings for the same firms (Form 990s available on GuideStar). The UFR’s also listed a lower number of executives earning high levels of compensation than were listed on the Form 990s for the same firms. Why might this be a problem? Because the state Operational Services Division (OSD) depends on the information in the UFRs to determine how much in state funds to apply to that compensation. By regulation, state funds going towards an indivdual contractor executive’s compensation are capped at $143,986 a year, according to OSD. Take the May Institute, for instance. According to its UFR, the nonprofit contractor took in roughly $105 million in revenues in 2009, of which about 66 percent came from the Department of Developmental Services and a variety of other government agencies in Massachusetts. About 79 percent of the total revenues came from all government sources. As of April 8, 2011, the online UFR states that Walter Christian, the May Institute CEO, made $509,798 in salary and other compensation in the year ending June 30, 2009. Based on that number and on information from OSD, we calculate that OSD would have been required to “disallow” about $366,000 of that total compensation, meaning that amount would have to come from other sources than the State of Massachusetts. However, the IRS Form 990 for the May Institute for the same 2009 fiscal year lists Christian’s total compensation as $1.087 million. That’s a difference of more than half a million dollars between Christian’s compensation as listed on the state’s UFR and on the IRS 990 form. If Christian really earned $1.087 million in compensation, we calculate that the state should have disallowed more than $940,000 of it, not just $366,000 of it. All of this suggests that based on the 2009 UFR, the commonwealth may mistakenly think that more than half a million dollars in potential state funds went into direct care or other operations at the May Institute, when it really went toward Christian’s compensation. I would note that the UFR website stated as of April 8, 2011, that the latest online version of the May Institute 2009 UFR had been submitted by the contractor on March 22, 2010, more than a year ago, and still hadn’t been reviewed by OSD. A previous version of the UFR had been submitted in December 2009. The website stated that there were “no issues pending” regarding that version. On March 21, I submitted a written question to OSD about the discrepancy in the listing of Christian’s compensation on the UFR and Form 990, and followed up with a phone call and an email on April 5, saying I was preparing a blog post about the issue. I still haven’t received a response. An OSD official told me in the April 5 phone conversation that he had been too busy to get an answer to my question (and a few related questions about the UFR) and was going on vacation the following week. He said he didn’t know when he would be able to get the answers. It’s not just with Christian’s compensation that there are discrepancies between the UFRs and the Form 990s, however. The May Institute UFR lists only Christian and one other executive as making over the $143,986 compensation threshold, above which compensation must come from sources other than the state. The Form 990 lists a total of 13 employees of the May Institute as making over that threshold amount. The discrepancy in listed compensation between the two forms was $3.4 million. For Vinfen, the 2009 Form 990 listed a total of 10 employees as making over the threshold compensation for a total of $2.2 million, whereas the UFR lists a total of only four employees making only $997,000 — a difference of $1.2 million. The UFR website stated as of April 8, 2011, that the latest online version of the Vinfen 2009 UFR had been submitted by the contractor on December 10, 2010, and was found by OSD to be “deficient.” No further information was provided. For Seven Hills, the 2009 Form 990 lists four employees making over the threshold, for a total of $1.2 million in compensation, compared with the UFR, which lists only two employees making a total of $816,000. That’s a difference of $385,000. Last month, The Globe published a letter I wrote on behalf of COFAR, suggesting that Governor Patrick scrutinize the salaries of human services contractors as part of an overall crackdown he had announced on salaries in the state’s independent agencies. In response, Michael Weekes, president of the Providers’ Council, accused me of attempting to “smear the leaders” of the human services sector and of “making scurrilous attacks that distort the facts and mislead taxpayers.” Weekes said my concern over executive compensation was “moot” because state law caps the amount of state funds that can be applied to executive compensation. He added that my “real concern” should be over the low pay of direct-care workers in the human services contract system, many of whom only make $12 an hour and have gone three years with no increase. I agree with Weekes that we should be concerned over the low pay to those direct care workers. That’s exactly why we’re asking these questions about the salaries of executives making as much as $1 million or more a year, and whether those executives’ salaries may be soaking up state funds that should be going to the direct care workers.